How much time do you spend in your car commuting to and from work? Do you listen to podcasts or use navigation apps like Google Maps? These are the two most urgent reasons that encouraged me to find a smartphone car mount that is both convenient and visible (Toyota Camry Hybrid 2007). I’ve had car mounts in the past and they have been less than stellar. 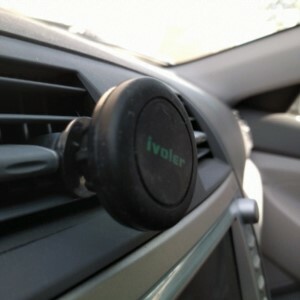 But I’ve recently purchased a new magnetic, swivel air vent mount for my car. I was at first a skeptic, but now find myself using it all the time, even if I’m not actively using my phone. In the past, I’ve used other types of mounts that “clamp” onto the phone. Even though these older car mounts are sturdy, there were two problems. Because this particular type of mount requires clamping, I’d have to tighten the sides of the mount when I attach my smartphone. In a similar method, I’d have to detach the smartphone by pressing a release trigger. At first thought, this does not sound like a hassle. But I quickly discontinued use due to the added steps each and every time I got in and out of my car. With the power of magnetic, attaching and removing the smartphone is as easy as putting a magnet on the refrigerator. Since some of the older generation smartphone car mounts were larger in size, much of the back of the phone was covered. This often leads to overheating and in extreme cases (when using GPS Navigation and streaming audio via Bluetooth while charging), often while on a road trip, my phone would overheat and even become sluggish or shutdown altogether. With the magnetic mount, the back has a much smaller profile which allows the vents to better “cool” the phone. This is a huge plus to both smartphone performance and longevity of your smartphone. Smartphone car mounts that suction to your windshield are good, but because they're often times in direct sunlight during daytime driving, this adds to overheating. Reaching the phone to answer calls becomes a problem because the windshield is often times much further away. Because the air vents in the car move around, it’s a MUST that the smartphone car mount swivels to allow you easy viewing. Having to turn your neck to view the smartphone is unsafe and highly NOT recommended. This one mount has the ability to swivel, though you have to adjust the swivel before you start driving. Don’t buy a vent styled smartphone app that doesn’t swivel! Can a Magnet Safely Support My 6-inch Smartphone? One of my biggest concerns was if such a small mount can hold my smartphone in a safe manner. The heavier the phone, the more powerful a magnet is required. The more powerful magnet that is there, I assumed there was a higher chance of the magnet wreaking havoc on my electronics. Turns out I have a Google Nexus 6P. It’s 178 grams (6.28 oz) with a 6 inch screen. One of the larger smartphones. It has no problem supporting this phone. The vent does get pushed to the down position due to the wait of the phone, but with the swivel action, I can point the phone screen upwards! Will this Car Mount Fit My Lifestyle? One thing that is required is a magnet on your smartphone. If you don’t have a case, then this type of car mount isn’t for you. Since I always have a case to protect my smartphone from drops and scratches, sliding the magnet between the case and phone is the perfect solution. The magnet isn’t exposed and the magnet has no problem working through the case. If you really don’t want a case, there is the ability to stick the magnet via a sticker to the phone, but it would be very ugly. It’s much better to get a case. What I dislike about this Smartphone Car Mount? The mount clamps to the vent, but via plastic and pressure on the vents. Though I have no problems using it on one car, I did try moving it to a second car and found the mount to be much less weak. My guess is the more cars you use the same smartphone car mount on, the weaker the plastic connection become over time. This product is so good that I’d recommend getting one for each car, just to be safe. The model I got was the Magnetic Car Mount, iVoler Air Vent Magnetic Universal Cell Phone Car Holder for iPhone 6/6S Plus, Galaxy S7/S6/S6 Edge, Note 5, Nexus 6P 5X 360° Flexible Swivel Ball Head 100% Safe with Powerful Grip for $3.99 with a promotion code. Well worth the money and I wish I had ordered more!